The long-awaited stand alone Missoni store got th official seal of approval from Angela Missoni herself last night and Dazed Digital talks to her about the fresh direction for the brand. Whilst the store has been open for a few months, Angela Missoni rolled into town last night to officially fete the opening of the first stand alone Missoni store in the UK, something that has long been overdue. 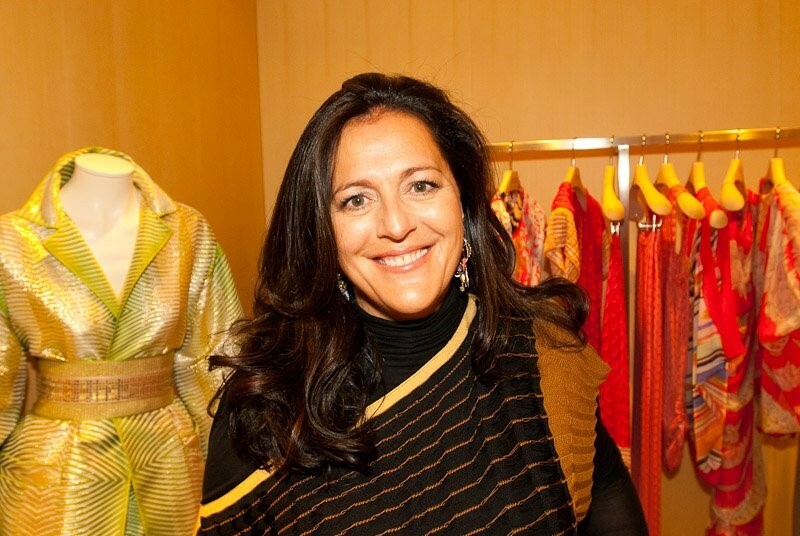 Coming off the back of picking up a World Fashion Award, showing a stunningly layered and directional A/W 09 collection and also turning fifty, Angela Missoni has much to beam about and we spoke to her about 2009 as well as her achievements in augmenting the Missoni code. Dazed Digital: Why has it taken so long to open up a stand alone store in London? Angela Missoni: It's been 15 years since we wanted to open a store in London and I would have loved to have open a store earlier. But we are a family company and are in fact very small. The name/brand is big but the company is quite small. A few years ago, we restructured the company and so a store in London was part of that plan. DD: It's been quite a momentous year hasn't it for you - you recently turned fifty and you've also just picked up a World Fashion Award at the Women's World Awards - how do you feel about all of this? AM: Yes, I'm a Wonder Woman now! No, I mean turning fifty is just normal. I feel that now that my children are grown-up, I'm feeling really like an 'old' designer. This year actually gave me courage to do a fresh collection. DD: You've touched onto my next question which is about your latest A/W 09 collection. I thought it really demonstrated what Missoni was all about whilst taking it in a new fresh and modern direction. AM: It made me realised that maybe I was a little too established and playing too safe perhaps. It gave me strength to do this really young and fresh collection. You always think you're trying to make a statement with each collection. I knew that I wasn't afraid. I felt there was a need to be more fresh, more young and more in the direction of street fashion. I always think that you have to change when you're doing well. You don't have to wait when things go bad! Perhaps I developed the Missoni brand and products so much so that our factories can do anything with any kind of materials so I wanted to get back to the core of what Missoni is all about - the knitwear. I felt really confident that this was what I had to do. DD: Your daughter Margherita is a brilliant spokesperson for the brand - are there are any other muses that you see as embodying the younger spirit of Missoni? AM: I was really thinking about my younger daughter Theresa with this collection actually! She's twenty. DD: With this new direction, what can we expect to from the S/S 10 collection? AM: There's something in the volume that will go on and proportions. It will be different. I always try to extract colours so it may not be loud but it will be colourful. DD: How long do you think you can keep on playing with the Missoni codes and language that have been built up by your parents? AM: I'm not afraid of changing. Missoni has such a big heritage and I know that - I was there - I know how much my parents were explorers. I'm not afraid at all to go in new directiosn - new prints, new techniques etc - because it's part of the Missoni DNA, even the things that weren't there before. At this point, I realise that I've been doing the collection for 12 years and maybe I've added a few of my own codes to Missoni. So the vocabulary is now an even bigger one to work with.